DISCLAIMER: "Emergency!" and its characters © Mark VII Productions, Inc. and Universal Studios. All rights reserved. No infringement of any copyrights or trademarks is intended or should be inferred. This is a work of fiction, and any similarity to actual persons or events is purely coincidental. This story is only written for entertainment. No financial gain is being realized from it. The story, itself, is the property of the author. The cool mist from the hoses sprayed across his overheated body. He could hear the shouts of his station mates as they worked to make their way through the debris. His back hurt, his lungs burned, and his head swam, but he was conscious. That had to count for something. Having the air knocked out of his lungs from the impact of his SCBA on his back when he fell through the floor left him gasping for breath. Suddenly he felt the presence of another person beside him. "Where are you hurt?" "Well let's get you out of here." He could feel someone grabbing beneath his left arm and dragging him to his feet. Looking over at the man he could see that it was Marco. Then he felt someone grasp beneath his right arm and was surprised to see Mike Stoker the engineer. "Who's on the engine Mike?" "Don't worry about it. We had to get you out. Kelly has the victim. Roy's with the other one. Put this on." Mike held up his facemask which had come off in the fall. "Broken," was all he could choke out. The regulator had been damaged in the fall. The three men stumbled past Captain Stanley who was manning the hose. Together the group made their way out of the burning structure. Once in the glaring afternoon sunshine he had to close his eyes to the brightness. Great, he thought, possible concussion. He half walked and was half carried over to the yellow blanket where Roy was treating the victims. Roy glanced up at him as he knelt down onto the second blanket that Chet had spread out for him and was overcome by a strangling cough. Chet helped him take off his SCBA and turnout coat. Mike had returned to check the gauges on the engine; Marco was back on the hose with Captain Stanley. John Gage gradually lowered himself down on his side and suddenly Mike reappeared with the oxygen from the engine. "Here Johnny put this on." A few minutes later a second engine and squad arrived at the scene. Jim Weaver and Dale Summers from Squad 45 ran over to see how they could assist Roy. "Can one of you ride in with victim one? He is stable and ready to transport. I'll ride in with the second victim and John," Roy made his request as he looked over at his best friend. Johnny lay on his side with his eyes closed breathing in the precious oxygen. Roy could tell he was in some pain. He could always tell when Johnny was in pain even when he denied it. Not to mention the fact that Johnny always lay on his back. The fact that he lay on his side was like a giant red flag to Roy. "Sure Roy glad to," Jim agreed as he helped the waiting ambulance attendants secure the first victim on the stretcher. "Thanks guys, the second ambulance should be along any minute. We're almost ready to go too." Roy waved his thanks to Dale as he closed the ambulance doors and slapped the doors to signal that they were ready to go. "See ya at Rampart Roy," Dale said as he jogged over to Squad 45. Roy finished establishing the IV on his patient and contacted the hospital. "Rampart we have an additional victim, a Code I, male 26, pale, diaphoretic, victim of floor collapse, smoke inhalation, vitals to follow." "10-4, will stand by," Dr. Mike Morton could be heard through the bio-phone. "Okay Junior, where's the pain?" "I'm okay Roy, just smoke. I just got the air knocked out of my lungs." "Sure Johnny. I can see the pain in your face. Where?" Roy wouldn't let Johnny get away with concealing an injury no matter how small or possibly trivial. "Just bruised my back on the SCBA Roy, it's nothing." Johnny coughed out. "Okay Johnny let me check it out." Roy ran expert hands down his partner's arms and legs to be sure there were no breaks. He also checked for rib fractures. Surprisingly there didn't seem to be any. When Roy went to check Johnny's back his friend flinched. "What is it Johnny? Describe the pain." "Uh I think it's….." Johnny stopped in mid sentence. Roy could tell that his friend was processing the discomfort trying to pinpoint where exactly it was emanating from. "I think muscle cramps, just spasms." "Okay Johnny put this back on." He pushed the mask back over Johnny's nose and mouth. "Let me get some vitals." Roy proceeded to get the pulse, BP and respirations and reported his findings to Rampart. He started the requested IV. He couldn't give Johnny anything for pain, because of the possible head injury that Johnny had tried not to tell Roy about. However, Roy knew as soon as he had flashed his pen light into Johnny's eyes. "Can you get into the ambulance or do we need to get the stokes?" "Johnny?" Roy knelt beside his friend reaching for his wrist to take another pulse. He found no change. He called to his friend again. "Johnny are you with me?" Johnny stirred and coughed again. "Yeah Roy I'm tired. Wanna sleep." "You need to try to stay with me Johnny. You may have a head injury. You know the drill. Now can you make it to the ambulance or do you need the stokes?" "I've got him Roy," Captain Stanley said as he approached. "Come on John." The captain reached under his youngest crewman's arm and hoisted him to his feet. Johnny winced from the strain on his injured back. He sucked in air through clenched teeth. Captain Stanley settled Johnny on the bench in the ambulance. "Let me know how he is, if I need to call in a replacement." "Yes sir," Roy responded to his superior. "I think that is a strong possibility. 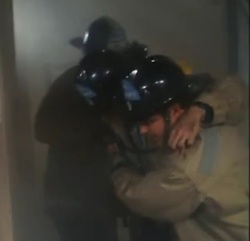 He's having spasms in his back from the blunt trauma from hitting the SCBA in the fall. He probably has a mild concussion, and then there's the smoke." "Okay Roy I'll put in the call as soon as I get back to the station, but you'll let me know how his is, right?" Roy climbed aboard the ambulance. Captain Stanley closed the doors and slapped them twice. He stood in the street as he watched the ambulance drive away. He could not help worrying about his youngest man. John Gage was like a son to him. Heck all of the men on his crew were like sons to him, but Johnny was special. He was the youngest and often came to Hank for advice, and God knows he somehow ends up on the injured list more than the rest of the crew. Deep down Hank knew it was because Johnny always made sure he was the last man out of a fire or rescue securing the safety of his friends as much as possible. Hank smiled and shook his head as he turned and strolled back to the engine. Chet, Marco, Mike and the crew from Station 45's had finished packing up the equipment, and they were all ready to return to quarters. "Well let's go." Hank waved his hands towards the engine. The three men jumped aboard and settled into their seats as Captain Stanley shook hands with the Captain from 45's. Once aboard the engine Captain Stanley directed Mike to take them back to the Station. "Roy will call us with an update on John. I know he hurt his back, but I don't think it is too serious this time." Mike smiled back at the Captain, nodded his head in agreement, but the quiet man didn't say anything. In the ambulance Roy sat watching his friend suffer through spasm after spasm and struggle with a deep raspy cough. He wondered how Johnny had managed to get himself injured again. "What happened in there Junior?" he asked not realizing that he had spoken aloud. "What?" Johnny asked then responded without anything more from Roy. "Floor collapsed. Fell, landed on SCBA, no air, regulator broke." "Okay Johnny, its okay, just relax. We'll be at Rampart in a few minutes." Roy patted his friend on the shoulder and then directed his attention back to their victim. Once they arrived at Rampart they were met by Dr. Morton and Nurse Dixie McCall. Roy assisted the ambulance attendants with the gurney carrying the victim. "Take him in three," Dr. Morton told them as he followed along side. "How are his vitals Roy?" His voice fading as the group disappeared into the treatment room. Dixie stepped up into the ambulance and gently stroked Johnny's forehead, "Hey tiger. Let's get you inside too." Johnny stirred and cracked open his expressive eyes. Dixie could always tell how her friend was doing by the looks of his eyes. When he was happy they sparkled, when he was sad or confused they appeared vacant as if he were searching for something or lost, and when he was tired or injured they seemed to beg for relief. "Come on I have a chariot awaiting you my friend. We will get you fixed up in no time." She gently helped him sit up giving him a minute to get his bearings. Johnny slipped the oxygen mask off and grabbed the canister as they stepped out of the ambulance. Dixie guided him over to the waiting wheel chair. She could tell that Johnny Gage was exhausted or was hurting somewhere, because he did not complain about the wheel chair. Any other time that his injuries were minor he would have gone on one of his tirades about how he could walk on his own. Another indication to his current state of health was that he held the oxygen mask to his face again as soon as he sat down. Dixie stepped behind the wheelchair and patted Johnny on the shoulder hoping by doing so she was giving him the reassurance that she understood he felt worse than he had let Roy know. Once in the treatment room Dixie helped Johnny up onto the exam table. He immediately moved to lie down. "Hold it tiger. Let's get your shirt off in one piece this time." Johnny let out a huff that she knew was an attempt at a chuckle. Glancing over at her friend she could see the corners of his mouth turned up. "Now that's better. I'm glad to see you still have your sense of humor. Now do I unbuckle those pants or do you?" Johnny smiled a full Gage grin at that comment, sat the oxygen mask on the table and carefully removed his pants. Now down to his boxers he looked at Dixie with a raised eyebrow and coughed out the question, "Can I lay down now?" Dixie smiled at him and came over to assist him as he lay back on the table. She saw the grimace of pain on his face as he did. Johnny immediately turned onto his side trying to relieve the spasm that had clenched the muscles in his back. "Whoa there where are you going? You need to be still and let me get some new vitals on you." "Back hurts. I fell on my SCBA and it caused some bruising and muscle cramps." "No self diagnosis here my friend, you stay put and I'll get Dr. Brackett to come see how things look." Dixie covered Johnny with a sheet and quickly exited the room. A few minutes later she reentered with Dr. Brackett only to find Johnny fast asleep. "He's exhausted Kel." "I can see that Dixie. You said he fell on the breathing apparatus, looks like he took in some smoke too." Dr. Brackett put his stethoscope to his ears and started listening to Johnny's lungs. He knew how tired the man was by the fact that he didn't flinch when the cold stethoscope touched his skin. "Well his lungs don't sound too bad. The oxygen is doing the trick. I can see the bruising here on his back. Let's get some x-rays to be sure there is no serious damage. Didn't you say something about a possible concussion?" "Yes Roy said he was sensitive to the pen light, but he seems completely oriented." Dr. Brackett gently shook Johnny's shoulder, "John…wake up for me." He was pleased to see that it didn't take much effort to rouse the paramedic. "Johnny I need to do a neuro check. I heard you might have hit your hard head again." Johnny chuckled and smiled at his friend. "John Roderick Gage, I'm at Rampart, I fell through a floor and landed on my SCBA and my back hurts like hell." Dr. Brackett and Dixie burst out laughing at Johnny's playful answer. "Okay you seem to have complete control of that brain of yours. We'll get some x-rays of your back and see what's going on. I think your lungs will be okay, but I would like at least one breathing treatment. Since you have a tendency towards pneumonia I will also give you some oral antibiotics that I expect you to take all of. If your back checks out I think muscle relaxers for a few days will do the trick, but you will probably miss at least one shift and need someone to care for your horses for a couple of days." With that Dr. Brackett waved at Johnny and left the room. "I'll be back after the x-rays." As he came out of the exam room Brackett was met by an anxious Roy Desoto. "Hey Doc. How's Johnny?" "Hello Roy. I think that partner of yours has some deep bruising on his back that is causing some muscle cramps kind of like whiplash might cause. He has a mild concussion and as you know some smoke inhalation. He is getting x-rays now and will get a breathing treatment. If the x-rays come back okay then he will be released with some antibiotics and muscle relaxers. He will be off at least one shift and I told him he will need to get someone to help him with the horses. He doesn't need to lift anything even hay." Dr. Brackett chuckled at himself over the hay comment. "Thanks Doc. Um can I go in?" "I don't see why not Roy after portable x-ray comes out, you can go on in. I'll be back when the films are ready." Brackett headed toward his office. Roy headed toward the coffee pot at the nurse's station. At least he could have a cup of coffee while he waited. It seemed he was always waiting on his partner. He shook his head at the thought. Johnny was a good fireman/paramedic, but he sure could get into trouble a lot. Just as he finished pouring his cup of coffee he could see the X-ray technician coming out of the room. Slipping in the door he could see that Johnny's eyes were closed. He lay curled on his side on the exam table and still had the engine's oxygen mask over his mouth and nose. He was breathing deeply. Johnny was asleep. Roy smiled down at his best friend. Thinking that he needed to let Johnny rest he quietly went over to the stool that sat in the corner of the room and made himself as comfortable as possible while he waited. A few moments later Johnny groaned, arched his back and coughed harshly. Roy was by his side in a flash. "Johnny?" "Yeah back cramped again. I hope Brackett gets back with some good medication soon." "He's waiting on your films." Roy settled back on his stool to wait. Johnny's eyes closed again. The door opened then and Dixie came in with someone from respiratory to give Johnny the breathing treatment that Brackett had ordered. "Roy why don't you come treat a lady to coffee in the lounge?" "Okay Dixie. I'll be right back Junior." Johnny nodded his head to let his friends know he heard them. Johnny relaxed and slept some more while he was getting the breathing treatment. He was not sure how long he was there, but a soft nudge on his shoulder drew him from his sleep. "John I'm going to release you now. Dixie will be in with your meds. I had the pharmacy fill them for you. She will also give you an antibiotic shot to get some into your system faster. The rest will be oral. I also have some muscle relaxers to help with the back spasms. Your x-rays looked good, just some serious strain and bruising. I'll have her give you some muscle relaxer in shot form as well to get you started. That should help you rest tonight. You can start the orals in the morning. Other than that Tylenol will help. Of course if you have any problems you know where to find me." He smiled at the prone paramedic. "Thanks Doc," Johnny responded sleepily. As he was told Dixie soon came into the room to administer his shots and gave him the brown bag with all of his prescriptions. Roy was not far behind her. "Come on Johnny Captain Stanley has your replacement ready at the station. I'm going to swing by there so we can pick him up and then we are going 10-8 to your ranch. If we get a call you'll have to wait in the squad until we are done," Roy reached out a hand to help his friend sit up so he could get dressed. "Dixie brought you these scrubs. They will be easier to put on, and then you can hang out in them at home if you want." The two friends were soon on their way back to the station. Johnny rested his head against the cool glass of the passenger side door. It was a quiet ride, but Roy didn't mind. He was glad that his friend was not seriously hurt this time. Out of habit he backed the rig into the bay. "You need anything from your locker Johnny?" "My wallet and keys might as well get my clothes and bag." "Okay be right back. You stay put." Johnny didn't intend to move. For the first time all afternoon his back did not hurt. His breathing was better and the Tylenol had helped his headache. He relaxed. Captain Stanley had heard the squad back into the bay and he leaned into the driver's side window. "John, if you need anything you call okay?" "Yes sir," he responded without moving. Roy returned from the locker room and stopped by the kitchen and let Johnny's replacement know they were going to drive him home. Gil Robinson, a former trainee of theirs and an old friend of Johnny's slid into the squad from the driver's side. "Hey John, feelin' better?" Johnny glanced out of the corner of his eye, smiled a little and shook his head. "Yeah good meds always make me feel better." The men chuckled as they pulled out of the station and headed towards Johnny's ranch. Once they had Johnny settled at home Roy and Gil returned to the station to finish out their shift. Johnny fell fast asleep as soon as his head hit the pillow. He awoke the following morning to the sound of music drifting out of the barn. His barn. Why was there music coming out of his barn? Looking over at the alarm clock he could see that it was nearly 10 am. Man those were some drugs Brackett had given him. He hadn't slept this late in….well ever that he could remember. Realizing that he needed to get up and take care of some personal business and find out what was going on in his barn Johnny slowly got out of bed. He found that he was very stiff and sore. Padding into the master bath he was suddenly overcome by a very strong back spasm. "Oh man. I need to find those pills Dr. Brackett gave me," he said aloud to the empty room. Making his way gingerly to the kitchen he downed the appropriate number of tablets, both antibiotic and muscle relaxers. He then started a pot of coffee, returned to his bedroom to get a hot shower and dress. After a very hot shower and time for the medication to set in he felt somewhat better. He came out onto his porch with coffee in hand. He could hear the music drifting out of the barn. Not noticing the truck parked behind his Rover, Johnny carefully walked over to the barn to see who was there. He could hear the sounds of the Steve Miller Band's "The Joker" playing inside. "Hello!" Johnny yelled as he entered his own barn wondering who he would find. The music was loud, and he didn't think anyone heard him. He glanced up into the loft to find none other than Mike Stoker tossing hay down to the stalls while singing along with the band. "Hey Mikey!" he yelled to his friend. Mike looked up and smiled at his friend. "Hey good morning, I thought you would never wake up. I've been out here for an hour or so since our shift got off." "What are you doing here Mike?" "Well Cap said Dr. Brackett told you that you would need someone to tend the horses for a couple of days. Beth took our boys to meet up with Joanne and Chris for some scout thing. They figured Roy and I would want to get a nap. Roy took Jennifer to the dentist. Marco promised his mom that he would help her at the church this morning. Chet is covering a half shift for one of the engine crew from 16's, and Cap and Emily had to go to a dance competition with the twins. So here I am." "God Mikey I don't think I have ever heard you say so much in one day," Johnny said laughing. Mike tossed a pitchfork full of hay towards his friend. "Hey I'm injured here. Watch it! By the way nice choice of music there buddy." "I love The Steve Miller Band," Mike said smiling. "Yeah me too," Johnny began singing along somewhat off key. Mike climbed down the ladder that led up to the loft. "I'm about done with the stalls Johnny. What else do you need me to do? The horses are already brushed and in the corral." "I guess that just about does it Mike. Thanks a lot for your help. Would you like something cold to drink or a cup of coffee?" "How about a cold glass of water and then a cup of coffee? It is strong right? You make the best coffee." "Well come on in and see for yourself." The two friends went into the house. Settled in the great room in front of the TV to drink coffee and catch some news. They both drifted off to sleep in no time. A couple of hours later the two men were awakened by a knocking at the door. Johnny's back was now in full spasm. Mike noticed his friend's discomfort and went for the door. "Hey Roy, glad you're here. I think Johnny's having some more spasms. I don't know if it is time for another dose of medicine or not. Um he came out to the barn around 10:30 this morning. I'm guessing he was up about 30 minutes then, so he probably had his last dose around 10." "Thanks Mike I'll check the bottles to see when he is due again and get him some Tylenol too. Be right back." Just as Mike went to shut the door Marco and Chet hollered at him from the driveway, "Hey Mike!" "Hey guys come on in." The two friends came strolling into the house with a couple of six packs of beer and some chips. Just as Mike went to shut the door again he could hear the squealing of young children running towards him. His and Roy's sons as well as Roy's daughter Jennifer all came bursting into the house. Joanne and Beth followed closely behind arms full of groceries. Right behind them were Captain and Emily Stanley with their twin daughters. Emily had brought a chocolate cake and brownies. Finally Mike was able to close the door. Johnny sat in amazement that all of his friends had come over to his house prepared for a cookout. His heart was warmed by the love and generosity they showed for him. "Uh thanks everyone. I…I don't know what to say." "Then don't say anything Junior. Just sit back, let your meds work and enjoy," Roy patted his friend on the shoulder. Each and every one of the members of the Station 51 crew knew that John Gage had gotten hurt trying to protect one of them again. Chet had told them how Johnny had pushed him forward with the victim when he had sensed the floor was going to go. These men were the only family John Roderick Gage had. His own family had died many years ago. They knew the lengths that Johnny would go to in order to protect each and every one of them. They were willing to do the same for him even if it meant mucking the stables in his barn. These men were a family, brothers in the fight against fire, hazard, injury, and death.